After several strange encounters a man begins to question his own sanity in search of what he believes is the truth. After several strange encounters a man begins to question his own sanity in search of what he believes is the truth. I saw THE WATCHERS at the Big Apple Film Festival. I was there to support director Carmen Vidal and her equally impressive film SLATE. THE WATCHERS had me on the edge of my seat from start to finish. Highly suspenseful, with lots of twists and turns and a handsome leading man in Jeff Moffitt, who plays a man who becomes the pursued; he's suddenly being followed by some very unusual characters. I was impressed at the quality of the film, expertly shot and edited by director Cy White. I was delighted to read that the film is receiving nice reviews. I hope it receives even more. Writer's Jeff Moffitt and Sy Cody White have created an edge of your seat thriller written in the same tone and genre as the "Twilight Zone" & Alfred Hitchkock. 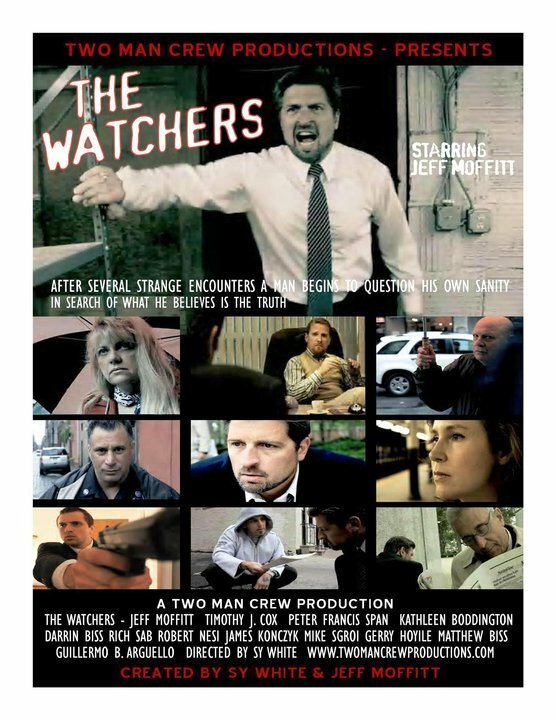 Suspense, intrigue, and spell-binding fun is what awaits the watcher of "The Watchers"! From start to finish the audience is help captive with so many twists and turns and red-herrings you are kept in suspense until the very end of the movie. John Porter played by Jeff Moffitt is a man who's life is spinning out of control and his sanity suddenly comes into question as he goes in search of the cause to his bizarre troubles. Actor Moffitt does an excellent job playing the role of John Porter...very believable character! Actors: Timothy J Cox, in his role as the doctor, and Peter Francis Span as the Mysterious Man also are deserving of an accolade as are; Robert J Nesi in his role of the police officer. All characters in their roles did an amazing job in my opinion.